To make a fun style statement in your kitchen, ditch the plain white mugs in favor of some vintage ones that are chock full of character. From understated elegance to kitschy and colorful, there’s a mug to suit every personality and décor. Vintage elements are a great way to add personality and make sure your kitchen stands out. These days you don’t need to troll through a flea market to uncover great finds; sites like Etsy have a huge selection of a range of styles and eras. Not to be confused with the similarly colorful Fiesta Ware, Siesta Ware was popular in the 1970s. Besides the ability to mix and match bright colors to create a unique set, Siesta Ware also had fun graphics and unusual faux wood handles. This set of six mugs is the perfect example, with a spectrum of vibrant colors and whimsical rooster, clock and coffee pot illustrations. Known for its quality and durability, Arcopal France was a popular producer of glassware and dinnerware and has sadly been discontinued. 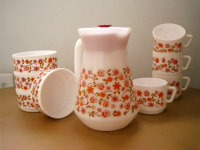 Luckily you can still get your hands on examples of their craftsmanship, like this flower power-themed set from the 1970s, which comes with a coffee pot, four mugs and four chocolate or cereal bowls. The tempered milk glass (so called for it’s white color) is five times more durable than China, break resistant and dishwasher safe. 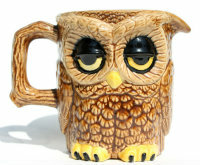 For a fabulously kitschy option that we love, check out this droopy-eyed owl that can serve double duty as a mug or a creamer. Also from the 1970s, this heavy-duty ceramic mug looks the same on both sides and has a handy, tree trunk-style handle. Anyone else having a flashback to back-to-school specials and commercials from their childhood? 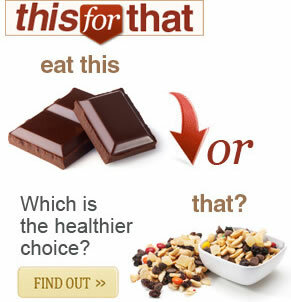 And, because everything is cyclical, owls have become trendy in a big way lately, so this was way ahead of the curve. Calling all cat lovers! 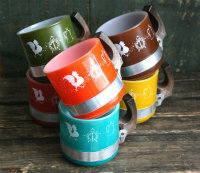 This set of six bright mugs is sure to make you smile even before you’ve had your morning coffee. The cute kittens with pink bow and super flower power background are just irresistible. We love the foot on the mugs, plus the pretty design of the handles. Most likely from the 1960s (what gave it away? 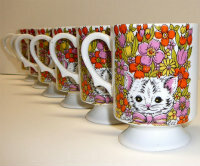 ), these porcelain mugs are a must-have for feline fiends. Mid-century design is known for its clean lines and understated elegance, and this collection of six coffee cups displays just that. With their aqua glaze and light speckling, these cups will bring a serene and classy touch to your mornings. Made in Los Angeles by Santa Anita Pottery (1939-1960) they’ll never go out of style. Keeping with the mid-century design, these unique white snap mugs are not only super stylish but multi-purpose. Each stylish glass snaps in (and out!) 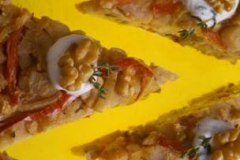 of the moddish plastic base, so they can be used as coffee mugs or simple dinner glasses. 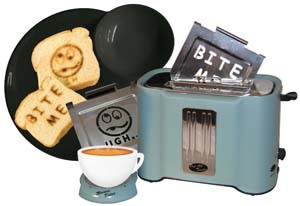 Keeping them snapped in is perfect for handling hot beverages like coffee and tea.